This, right here, is what I like to make when I’m in a bit of a kitchen rut and have no idea what I want to eat for dinner… or breakfast… or lunch… or when I’m having people over for brunch… Really, it’s an anytime dish that is way too easy to make. Quick and smokey shakshuka with feta and lemon-y, parsley-y couscous is as easy as chopping a few things, boiling water, heating some sauce, and poaching some eggs. A delish anytime meal, lickety-split. Heat the olive oil in a large frying pan over medium heat and add the onions. Season with a bit of salt and pepper and cook, stirring often, for about 6 minutes or until the onions start to soften. Add the finely minced garlic and cook for an additional 2 minutes or so just to cook off some of that raw garlic hit. Stir in the smoked paprika, chili flakes, and cumin and allow the spices to toast for about 1 minute or so. Deglaze the pan with the white wine, if using, or add two tablespoons of water. Add the halved cherry tomatoes and continue to cook over medium heat for about 5 minutes or until the tomatoes start to break down a bit. Add the canned tomatoes and stir well to combine. Cover the pan and lower the heat. Allow the sauce to simmer away for 15 to 20 minutes, stirring occasionally. Stir in 2 tablespoons of parsley and season with salt and pepper to taste. Meanwhile, set your kettle to boil and pour your couscous into a heatproof bowl. When the water has boiled, pour 2 cups of boiling water onto the couscous, season with salt and pepper, stir, and cover tightly with plastic wrap. Allow this to sit for about 8 to 10 minutes while you finish up your shakshuka. Using a spoon, make slight wells in the tomato sauce and crack an egg into each. Cover and cook the eggs over medium-low heat until the whites are firm and the yolks are just slightly cooked but still runny, about 6 to 8 minutes. Fluff your couscous with a fork, stir in the lemon zest, lemon juice, and remaining parsley, and divide between four plates. 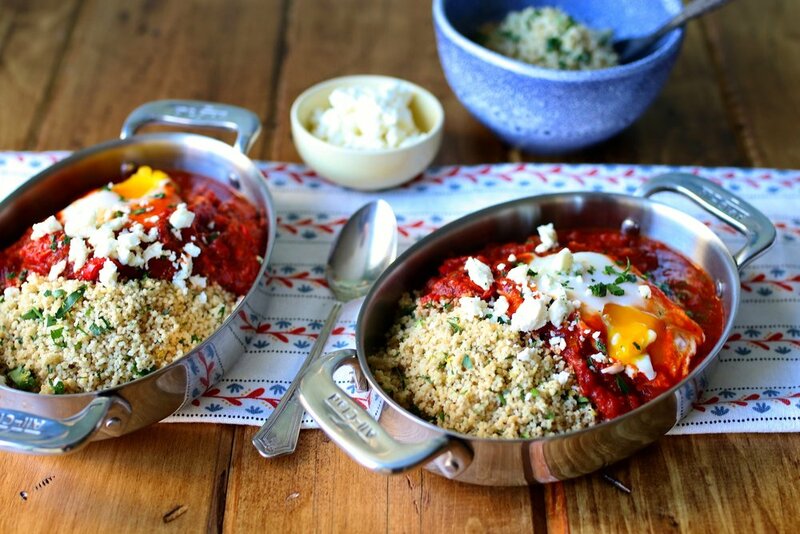 Top each plate with an egg or two plus a good dose of that sauce and scatter with crumbled feta cheese. If you ever find yourself in Kitchener, Ontario, do yourself a favour and visit The Yeti Cafe near the Kitchener Market. It is, hands down, my all-time favourite breakfast place ever and their vegan bacon (aka jazcon) is out of control delicious. I genuinely think I could eat the equivalent of my bodyweight in this stuff and I would have no regrets. This here is my take on their vegan bacon scattered onto my take on a breakfast-y banh mi. It’s my favourite at-home breakfast sandwich to whip up on a lazy Saturday morning! Also, hot tip, even if you don’t make this full recipe, just give hoisin a try on your next eggy breakfast sandwich. It’s a trick I learned from the geniuses over at The Yeti and it has changed my breakfast sandwich game for the better. For the Do Chua (quick pickle), mix the daikon and carrots together and place them into a large glass bowl or jar. In a medium saucepan over medium heat, combine the water, rice vinegar, sugar, and salt. Stir the mixture until the sugar and salt have dissolved then pour it over the daikon and carrots. Place the veg in the fridge to pickle for at least 20 minutes or up to one week. For the coconut bacon, preheat your oven to 350ºF and line a large rimmed baking sheet with aluminum foil or parchment paper. In a large bowl, toss together the coconut flakes, oil, tamari or soy sauce, liquid smoke, maple syrup, smoked paprika, and five-spice until very well combined. Spread the coconut out onto your prepared baking sheet and bake in your preheated oven for 10 to 13 minutes, giving the coconut a stir about halfway through. Keep your eye on it because coconut tends to go from golden and delicious to burnt and inedible pretty quickly. Remove the coconut bacon from the oven and allow it to cool to room temperature. To assemble the breakfast banh mi, fry the eggs to however you like them and spread each of the buns with a good helping of mayonnaise and hoisin sauce. Layer a hefty ¼ cup of coconut bacon overtop followed by cucumber slices, two eggs, Do Chua pickles, and a scattering of cilantro and green onions. Drizzle the top with sriracha if you like things a little spicy and dig in! *Be sure to use large coconut flakes, not shredded coconut. Like bread, making homemade pasta brings me back to rainy days stuck inside the cottage playing with the one thing my mom has always been an expert at making: homemade Play-Doh. Somehow, when occasion would strike and we’d be stuck inside with a summers’ day worth of energy, she would turn a couple of packets of Kool Aid into this amazing smelling, brightly coloured dough that we could spend hours and hours playing with. I, always being rather kitchen-inclined, would knead the dough and shape it into any sweet treat I could dream up while my brother sat next to me mashing every colour together until he was left with a big muddy looking mass… We’re different, my brother and I, but there are a few very strong similarities that we do possess. A doofy laugh, some cocktail knowledge, lanky limbs, and an undying love of pasta. I, always being rather kitchen-inclined, would knead the dough and shape it into any sweet treat I could dream up while my brother sat next to me mashing every colour together until he was left with a big muddy looking mass… We’re different, my brother and I, but there are a few very strong similarities that we do possess: a doofy laugh; ample cocktail knowledge; lanky limbs; and an undying love of pasta. Making homemade noodles might seem a bit daunting and, yes, it is a bit more of an undertaking than tearing open a box of dry rotini on a Tuesday night but it is oh so worth the effort. I've scaled this recipe to serve two as I find it's perfect for a date night meal but feel free to multiply the recipe to serve more. If you can't find '00' flour in your grocery store, all purpose will work just fine. The two flours have similar protein/gluten levels (between ~10-12%) and are therefore pretty interchangeable when used for fresh pasta. The main difference between the two is that '00' has been more finely milled thus resulting in a slightly better texture. Now, don’t be daunted by the length of the method below. In addition to detailing a method using good old-fashioned elbow grease, I've also included a couple of different tactics for making the dough using a little help from some handy dandy kitchen equipment. Over the next few weeks, I’m going to be posting some of my favourite sauces, fillings, and pasta shapes so stay tuned! In the meantime, give this a whirl, roll it out thin either by hand or with a pasta roller, and cut into long, thin noodles – it’ll be perfect draped with carbonara or my favourite tomato sauce. Dump the flour onto a large work surface and sprinkle with salt. Using you hands, gently mix the salt through and create a well in the centre of the mound. Crack the eggs into the well, being careful not to let them spill out over the edge. Add the oil and, using a fork or the tips of your fingers, beat the eggs and oil together and begin to incorporate the flour by pulling it in from the inner wall of the well. Once the mixture becomes a bit shaggy and tricky to work with, start using your hands to knead the dough into a cohesive ball. At this point, set the ball of dough aside and discard any scraggly dry bits and flour that is left over. I typically have about 1 – 2 tablespoons of refuse at this point so don’t feel the need to try to incorporate everything. Bring the ball of dough back over to your work surface and continue kneading for about 8 – 10 minutes or until the dough is elastic and smooth, adding a dusting of flour when necessary. Wrap the dough in some plastic wrap and set aside to rest at room temperature for 30 minutes before rolling, cutting, shaping, drying slightly, and cooking. If you’re looking for a bit of a tidier method, feel free to use your stand mixer or a food processor. For the stand mixer approach, combine the flour and salt in the bowl of your mixer and create a well. Crack the eggs into the well and add the olive oil. Using a fork, whisk the eggs and oil together and incorporate the flour until a shaggy dough forms. Fit your mixer with the dough hook attachment and knead on low for about 8 minutes or until the dough is smooth and elastic. As with above, if a few tablespoons of flour are left in the bottom of the bowl, no worries! Cover the dough with plastic and allow it to rest for 30 minutes before using. For the food processor approach, toss the flour and salt in the bowl of the food processor and pulse a few times to combine. Crack the eggs into a glass measuring cup, add the oil, and give it a whisk. With the mixer running, slowly pour the egg mixture through the chute and blitz until it all comes together into a smooth dough. Remove the dough from the processor, leave any scraggly bits behind, and give it a bit of a knead for about 4 or 5 minutes, adding flour when necessary. As with above, allow the dough to rest covered in plastic for 30 minutes prior to using. I have a serious problem when it comes to deviled eggs. It’s the same problem I have with what I call “church lady” sandwiches. You know the ones. Crustless, cut into fingers, often served at church picnics or after special services, scarf-able in less than two bites. I’m hoping that I’m not alone here but the issue I tend to have is that if either of these tasty little retro treats are present at a party, I will eat my body weight in them. The feeling I get after realizing I’ve polished off a half dozen eggs or the equivalent of three full-sized sandwiches falls somewhere between pride and shame but, in all honesty, it’s totally worth it. In my perhaps slightly biased opinion, deviled eggs are the perfect party food. They are salty, packed with flavour, and are just about the perfect size for guests to enjoy without hindering their ability to chit chat like some larger sized party snacks might. The classic is a classic for a reason – everyone loves them. But here, I make an argument for a slightly updated version. These carbonara deviled eggs bring together some of my favourite ingredients to work with. Salty pecorino cheese, meaty pancetta, sooty pepper, and fresh parsley come together in that classic yolky filling to create the most scrumptious couple of bites you ever did taste! Give these little guys a try but just don't blame me if you pull a Mary and eat the whole lot yourself! To hard boil your eggs, place them in a single layer on the bottom of a medium saucepan and have a tight fitting lid handy. Add enough cool water to cover the eggs by 1.5 inches, add the vinegar, and bring to a boil over medium heat. When the water has reached a boil, quickly cover the pot, remove from the heat, and set a timer for 13 minutes. Allow the eggs to sit, covered, until the timer goes off then immediately drain the eggs and plunge into an ice bath to stop the cooking process. Once the eggs are cool, tap them on the counter to break up the shell a bit. I like to put a few cracks in the top and bottom of the eggs and use that little bubble area on the bottom of the egg to start peeling. Meanwhile, cook the pancetta slices in a medium pan over medium heat until crisp. When done, remove the pancetta and allow it to cool and reserve ½ teaspoon of the pancetta fat from the pan. Finely chop the pancetta so that it almost resembles coarse bread crumbs and set aside, reserving about a tablespoon of the pancetta crumb for garnish. Using a sharp knife or a piece of thread wrapped around your fingers like you would floss, slice the eggs in half from top to bottom. Pop the yolks out of each egg and place into a small mixing bowl. Mash the yolks with a fork and stir in the mayonnaise, pancetta fat, 1 ½ teaspoons parsley, 2 tablespoons pecorino, pancetta crumbs (other than the garnish), salt, and pepper. Mix well until everything is nice and smooth and divide the yolk mixture back into the egg whites. If you’re just looking to get the yolks in there, a spoon will do just fine. If you’re going for a snazzier look, transfer the yolk mixture into a zip top plastic bag or piping bag and dollop a little swirl into each white. For an additional little garnish, place a nonstick skillet over medium heat and scatter in the remaining 2 tablespoons of pecorino. Allow the cheese to melt and start to crisp. As soon as the cheese is crispy and just slightly browned, remove it from the pan and allow the crisp to cool. Break it up into at least 12 pieces and set aside. When ready to serve, top each egg with a little piece of the pecorino crisp, a sprinkling of parsley, a bit of the remaining pancetta, and a bit more pepper.